Stephen Curry is going to let his daughter be who she is. Over the course of the 2014-15 NBA season and playoffs, Stephen Curry and the Golden State Warriors took over the basketball landscape. And as the reigning MVP marched his team toward a title, the world got to meet Curry’s daughter, Riley. 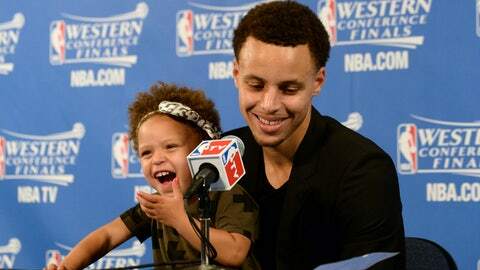 She became the star of postgame press conferences and viral videos, adding an adorable touch to the Finals. There were some, however, who criticized Riley’s presence, saying it made it difficult for the media to do their jobs. To those people, here’s fair warning: Don’t expect an apology from Steph any time soon. I was kind of caught off guard when I heard some people thought it interfered with media getting their job done or just didn’t like me involving my daughter in the spotlight. But I wanted to bring my daughter with me and have that bonding time with her. Obviously, she took over with her personality, which is exactly how she is 24/7, but I’m never going to apologize for that. The Curry family has since added another member, daughter Ryan, who was born in July. That has Steph on top of his Disney princess game, for the most part. When asked, he was able to name the princesses from three of four movies. He also cops to his current lack of culinary skills and which children’s cartoon can have him annoyed at times. Most importantly for the family man, he credits Ayesha Curry for her ability to multitask and keep everyone on the same page. And if that page includes Riley showing off her big personality, so be it.